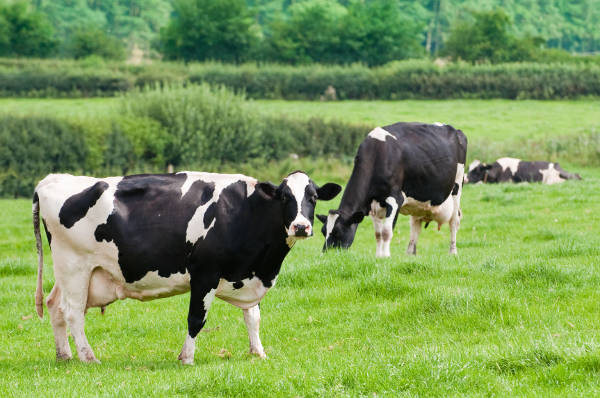 Genetic selection in dairy cattle may play a role in fertility. GENETIC selection in dairy cattle has long been used to help improve milk production and other traits that make dairy cattle more efficient, but attention to fertility hasn't been a big part of the mix until recently. Texas A&M AgriLife Research is leading a multi-university study aimed at helping producers determine if genetics can help improve the fertility of their herds. "Genetics and reproduction have not been extensively explored," said Dr. Pablo Pinedo, Texas AgriLife Research ruminant animal health scientist in Amarillo, Texas. "We think that genetics play a role in fertility, so we are looking beyond the effect of environment, which includes proper nutrition, management, health and comfort." The project, "Genomic Selection for Improved Fertility of Dairy Cows with Emphasis on Cyclicity & Pregnancy," was awarded almost $3 million over a five-year period from the U.S. Department of Agriculture's National Institute of Food & Agriculture. Halfway through the project, data from 11,000 Holstein cows have been gathered on commercial dairy operations by researchers in Texas, Ohio, Florida, New York, Wisconsin and Minnesota. The study includes researchers from the University of Florida, Cornell University, The Ohio State University, the University of Wisconsin, the University of Illinois, the University of Minnesota and Texas A&M University. "We have been checking cows for fertility, measuring multiple performance variables we can see, or phenotyping," Pinedo said. "We have been following these cows from calving to pregnancy, with two to three farms in each state, and also including cows that calved both in the warm and cool seasons. Calving season has an important effect on fertility due to heat stress during the summer. "We now have all the reproductive information, and we are building an index to rank these cows based on their fertility," Pinedo added. He said the information gathered include: reproductive diseases, resumption of ovarian cyclicity, body condition, lameness, metabolic diseases, time to pregnancy and pregnancy loss. "The top cow will be the one that never got sick and got pregnant in a timely manner," Pinedo said. The next step is to take the indexing information from this group of 11,000 cows and narrow the numbers to the top 1,000 cows and the bottom 1,600 cows, he said. This selected group will go through a DNA analysis utilizing the highest-density genotyping chip available. Then, the bioinformatics group on the team will analyze the genetic information and try to find significant associations between genetic variations and fertility, Pinedo said. He added that, so far, a large variation has been found in both disease presentation and fertility across farms and regions, providing excellent data for this study. "What we expect is to eventually be able to provide genetic markers for fertility that could be used by the artificial insemination companies for selection of highly fertile sires," Pinedo said. "If this is possible, then the dairy producer could improve the fertility of his herd by use of these top fertility sires." Also, while fertility is the ultimate goal of this study, he said, the data that were gathered by going onto these farms every week for the past two-and-a-half years can later be used to determine which points or markers are indicators of good health. The human health benefits of omega-3 fatty acids are becoming widely recognized; however, increasing the availability of these nutrients for consumers remains a challenge. Janna Moats, a master's degree candidate at the University of Saskatchewan, is attempting to resolve this issue by evaluating the effect of flaxseed supplementation in dairy cow diets on the nutritional value of the resulting milk. Flaxseed is commonly grown in western Canada and contains nutrients that could benefit cattle and people alike. This research is a collaborative effort between the University of Saskatchewan and a local animal feed company (O&T Farms Ltd.), with additional funding provided through the Industrial Research Assistance Program and SaskMilk. Moats and her program supervisors, Drs. David Christensen and Timothy Mutsvangwa, hope this research will lead to the production of omega-3 dairy products in Saskatchewan. The two-year research initiative is in its final stages, and the preliminary results look promising. The trial involved Holstein cows from the University of Saskatchewan that were fed a control diet, a diet supplemented with an unprocessed flaxseed product or a diet supplemented with one of two extruded flaxseed products. The results show that animal performance was maintained among treatments, while the fatty acids in the milk improved dramatically when cows were fed extruded flaxseed, Moats said. According to Moats, "Most commercial milk fat in Canada contains only 0.5% total omega-3 fatty acids. Our trial was able to achieve levels as high as 1.18% total omega-3s in the milk fat simply by feeding the cows extruded flaxseed." In addition to the increased levels of omega-3s, the researchers also saw a three-fold increase in another human health-related fatty acid: conjugated linoleic acid. Feeding extruded flaxseed products to dairy cattle has the potential to improve the health of the animal while simultaneously improving the nutritional value of milk for consumers, she explained. Moats will present her findings at the Joint Annual Meeting of the American Dairy Science Assn. and American Society of Animal Science in Orlando, Fla.
As the weather warms up, it's a critical time to watch for instability in forages, which can threaten the quality of rations and negatively affect production. "When aerobically unstable silage is blended into total mixed rations (TMRs), it can cause the entire ration to heat," according to Anthony Hall with Lallemand Animal Nutrition. "This leads to nutrient and energy loss, plus it reduces palatability. When cattle eat less of the TMR -- coupled with the fact that the ration they do eat is of lesser quality -- it's a recipe for impaired rumen function, reduced energy intakes and declines in production." Aerobic instability in silage is almost always caused by the growth of spoilage yeasts, which can cause increases in forage pH. In turn, this allows for further spoilage by molds and undesirable bacteria. At the site of spoilage, there are losses of digestible dry matter and increases in temperature. "Feeding hot TMR to cattle when it's already warm outside only further decreases potential dry matter intake," Hall said. "When cattle do eat the TMR, the poorer quality of a hot ration can push a cow with borderline rumen function into sub-acute ruminal acidosis (SARA)." SARA occurs when the rumen environment is below a pH of 5.8 for three hours or more during a 24-hour period. Costs from SARA are estimated at $1.12 per cow per day, making it recognized as the most important nutritional issue of dairy cattle on a whole-herd basis. When SARA occurs, rumen function isn't optimized to make the best use of any ration, Hall said. To help reduce the risk of production losses, Hall recommended preventing forage losses and heating by using a well-researched forage inoculant that can help combat aerobic instability. Inoculants using the high-application rate Lactobacillus buchneri can help ensure that the forage base stays cool and stable in the bunk and can minimize heating in the TMR. Adding a probiotic active dry yeast can improve rumen function and increase fiber digestion for all life stages of both beef and dairy cattle, he noted. "Reducing the risk of heat stress and SARA in your cattle can help preserve production and (dry matter) intake," Hall said. "Be on the lookout for hot, unstable silages and the profit-robbing effects of SARA. Ask your nutritionist or feed supplier what you can do to minimize production losses."